BrutalMania.IO – Review, Strategy, Tips & Tricks! BrutalMania.io is an online fighting arena IO game where players fight against one another with nothing but their wits and their weapon of choice. It’s a free-for-all arena where mindless violence and brutality isn’t encouraged- it’s recommended! The game kicks off with the Settings where you can adjust the Music, Sounds, Blood Effects and Language. Click on OK to proceed to the Daily Rewards section and doing some actions to get more coins, i.e., Liking on Facebook, Following on Twitter, Subscribing in YouTube and Following on Instagram. Then, you’re taken to the main screen where you can choose your Name, Weapon and view a short How To Play section at the right part. Your avatar moves to where you point the mouse cursor. You attack with your weapon by clicking the left mouse button and sprint by clicking and holding the right mouse button. You collect Orbs that are scattered around everywhere to gain levels, and when you kill enemies you score coins. Leveling up gives greater max HP and more coins, and more coins gives you weapon upgrades for a bigger club to whack your opponent’s head with! Coins can be spent to level up your warrior and upgrade your weapons. Slay online enemies and climb the Leaderboard for greater glory. High level players get the lion’s share in BrutalMania.io, so it’s in your best interests to lay low at first. Pick your weapon, but don’t use it yet, as your primary objective is to collect Orbs and level up your warrior as much as possible before starting over. Remember that leveling gives you greater max HP and coins, which is the key to dominating BrutalMania. A good rule of thumb is to level up your Weapon first and then your Evolution next. Each player will have a name and an HP bar displayed right below their avatar. The HP bar and the warrior’s appearance should give you an idea of when you should fight and when you should run. Naked characters are level 1’s that should be attacked. When you see a stronger opponent with 1 bar of HP, go for it. Collecting Orbs will give you XP, and leveling gives you a fair amount of coins to use on Weapons and Evolutions. Boosts are great for mixing things up. For instance, you’ll want to boost and escape the moment you see a higher level warrior coming your way or when you see a huge orb. You’ll also want to boost straight to a weakened enemy to finish him or her off to gain XP and coins. Swings should be timed for maximum efficacy. Don’t forget that your warrior will swing the weapon in the direction where you point the mouse cursor, which can mean the difference between victory and defeat in the heat of battle. AdBlock can be disabled by going to your browser’s Extension settings. 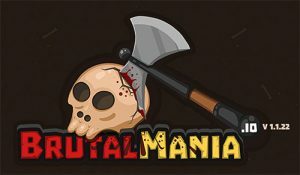 BrutalMania.io will reward you with more XP and Coins, which is always good for leveling your character and weapons.